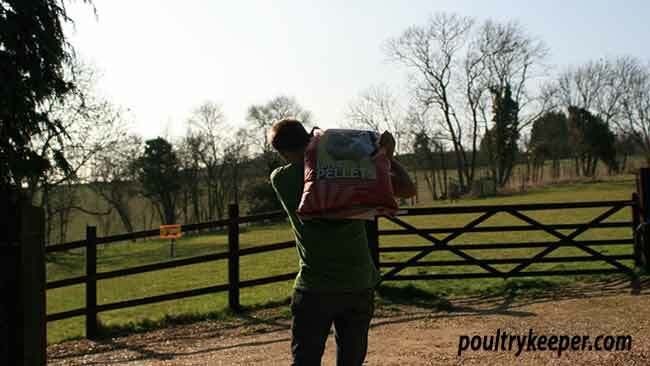 Storing poultry feeds sounds straight forward enough but there are a number of pitfalls to watch out for, especially for the newcomer. 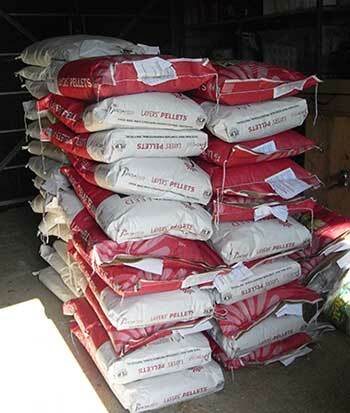 When you buy a complete feed (usually a loose mash or pellet) or mixed corn from your supplier it will normally come in a 20Kg bag (although some mixed corn comes in 25Kg bags). You will need a well ventilated, cool, dry shed or similar to store it in. To prevent the feed from absorbing moisture, it should not be stored on a cold concrete floor, even if it is a dry floor because it will absorb moisture from condensation. Using a wooden pallet is the preferred method of storing bags of feed but you can improvise using some pieces of wood if you can’t get hold of one. This allows air to circulate underneath them and prevents the condensation problem. The next problem is vermin. Rats and mice will soon eat their way through your precious supplies so if you can, ensure rats cannot get into the storage area and if mice can get in, leave traps set nearby and check them regularly. When setting mouse traps, chocolate is particularly effective and lures mice away from the smell of your poultry feeds. Rat runs and holes should be well baited outside or you should have humane cage traps set and covered over against walls which should keep them away from your feeds. If you want to store 2 or 3 bags, then a good idea is to use a galvanised bins or containers. These are well worth investing in and will prevent rats and mice getting to your food. Rats can chew through wood and plastic but they can’t get through galvanised steel! The cheapest option for a bag or two is a plastic waste bin. This will stop mice (the most common problem) so providing you don’t have a lot of rats in the area, you should find this a satisfactory solution. For larger quantities that can’t be stored in galvanised bins like the 50 bags shown in my garage to the right, your best bet is a vermin proof shed. I build a feed storage shed which has a concrete floor and every tiny hole is sealed. The door must be tight fitting because mice can squeeze through the smallest of holes. Feed is stored on wooden pallets and a gap is left between the bags and the walls of the shed to allow ventilation. There are metal grills at high level that allow air movement. The shed must be located in the shade so it doesn’t heat up too much in the sun or the nutrients in the food will be destroyed. Whilst buying in bulk does allow me to pay less per bag, it does mean I have to keep an eye on the time I store it. Off to the shed. Moving my delivery of 50 bags to my storage shed keeps me fit! Finally, keep an eye on the best before dates on the bags of feed. Whilst the feed seems to look alright, many of the nutrients and vitamins will have depleted after the best before date and chick crumbs or growers pellets that may contain added drugs may not be as effective. 3-6 months is the normal length of time you get when buying feed, so make sure you can use the amount you buy before the best before date.